The Fall round-up is the last opportunity for ranchers to gather, work and shop cattle before winter. Mature calves will be weaned and soon manage new lives on their own. Some cattle are shipped to market and others will remain in the herd. 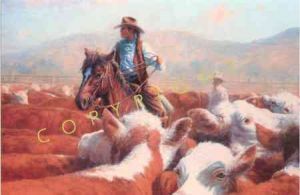 Cowboys and cowgirls often work side by side, partly as a result of necessity, but primarily because they love the life they are blessed with. You can bet Valerie's day won't end until the last cow has left "The Working Pens."